Michael Buble Live in Cape Town! The modern crooner is set to make his return to Cape Town in 2015. I may have mentioned this before, but Michael was never “my type”. One of my friends attended his show and was totally bowled over, having no “skaam” in pushing her husband out the way to get a little closer to the smooth singer. Since then, I’ve made a point to pay attention to him while seeing him on TV and listening to his music. Turns out, he’s a super funny guy with a great voice (which we all know) and he’s also moved away from the big band classics and created his own big band pop songs that are a treat. My favourite is “Beautiful Day” which is a super happy song and totally current (and not old like we so often associate these big band singers to do). 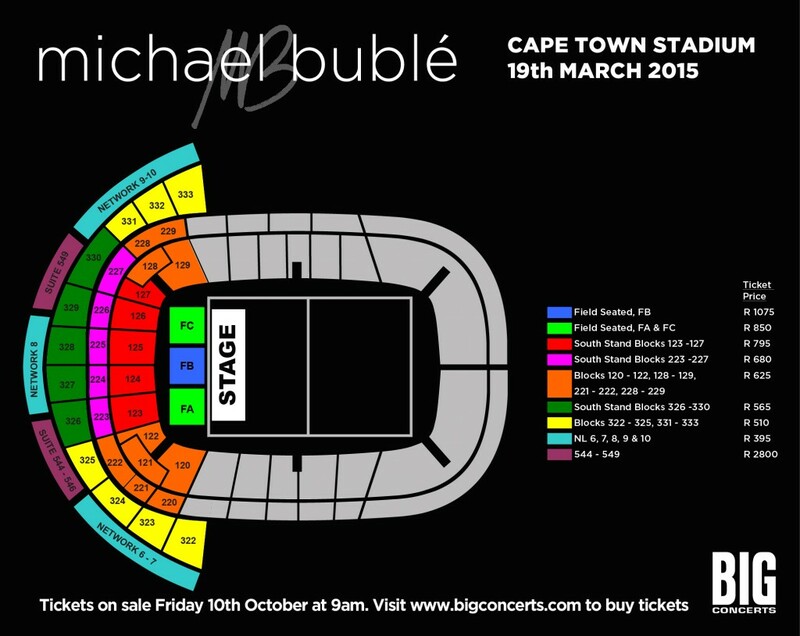 Last time Buble played at the Grand Arena, this time he’s getting an upgrade and will be playing at Cape Town stadium but it will be configured in an intimate setting. Managing Director of Big Concerts, Justin Van Wyk commented: “Michael Bublé will be the first concert in this new stadium layout. Fans will be treated to an evening of Michael Bublé with exceptional sound and a world-class production played out in an intimate setting. This new configuration will enable us to bring a whole range of new tours to Cape Town which previously may have been left out. However, capacity is limited with only 3 seating blocks on the field and we urge fans to get their tickets early”. Ticket Price: R395 – R1075. Tickets go on sale Friday 10th October 2014 at 9am from Big Concerts.